How Much Cake Can You Afford? Wedding cakes are typically determined by the serving and how complex the design will be. The cost can vary but it typically ranges from $1.50 to $4 per serving, and this is nothing. Some locations can charge up to $10 per slice and much more. It's easy to be in-love with the thought of having many unique flavors but it does come with a cost. Knowing your budget before you have a tasting can help avoid going beyond your cake budget. You want a cake that's compatible with your wedding style. Nothing is worse than having a wedding cake that doesn't match your overall wedding theme. Honestly, no one would really notice but let's face it, it's your big day so let's make it perfect! Make a list of your wedding venue theme, everything from the season, flower arrangements, menu and color scheme. Not only should your cake be a showpiece, we want to make sure your guests rant about how amazing it tastes, too. 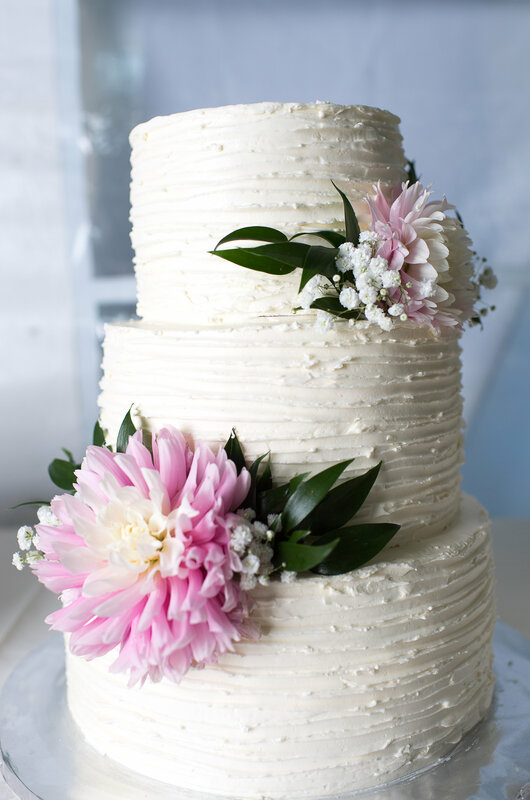 Make a list of some of your favorite cake flavors or what you think would be delicious on your big day. And, don't be afraid to get away from the traditional vanilla and chocolate. Get crazy. Create new combinations. I'm open to anything when it comes to having fun with cake flavors. Outdoor or Indoor Wedding? It Makes a Difference! Vermont weddings are known for the lovely barn venues but along with the adorable barn style, is a very hot climate for any cake. If you're having an outdoor wedding or at a barn, we will need to consider fondant options to help prevent melting cakes. Fondant-covered cakes can hold up against some of the warm summer days. If you're looking for a simple, yet elegant option that won't break the bank, fresh flowers or fresh fruit is the way to go. Cake toppers are another way to add more personality to your cake without increasing your cake cost. Sugar-paste flowers or gum paste work take a great deal of extra time since it's hand-made. All add-ons can raise the cake price. It's your big day. Let me handle the setup, delivery and making sure your cake or dessert table looks fabulous. We will determine the details of where the cake will be located, setup, working with the venue coordinator - before we sign the contract. Make Sure You Have Cake! It's shocking how many couples don't actually have a chance to try their wedding cake on their big day. Crazy right? With the photos, dancing, food and other wedding events, make sure your catering company saves you a piece of cake for a late-night snack. Want to get a starting price for a basic buttercream wedding cake? Use this cake calculator to get an idea!